Everywhere you go on the globe, you discover the human heart seeking to express gratitude in unique and beautiful ways. Everywhere you travel on this earth, be it by foot, plane, train, or the virtual landscape of the internet, you find that people of all cultures value the expression of gratitude. In some cultures, expressions of “thank you” are valued when given in words. In others, it is best conveyed through material objects or deeds, such as taking care of neighbors. Some cultures express gratitude through the art of bowing, and in one native tribe of North America, a guest shows gratitude by eating every bite served by their host with great relish. Many cultures celebrate the time of harvest by giving thanks for the bounty of Mother Earth. And almost every culture has traditional ceremonies and rituals that show their gratitude to the Supreme Power of the universe. Universally, gratitude is recognized as a virtue that brings happiness to both the practitioner and the receiver. It is a virtue practiced and promulgated by the wise ones who understand its great power. Gratitude is one of the divine virtues that Gurumayi teaches about extensively in her talks and writings. In this month of November, you, the global Siddha Yoga sangham, are invited to share your favorite proverbs, quotes, and sayings on gratitude from your own country or culture. You may also wish to share a custom or practice of gratitude that is unique, or share about the significance that gratitude plays in your part of the world. 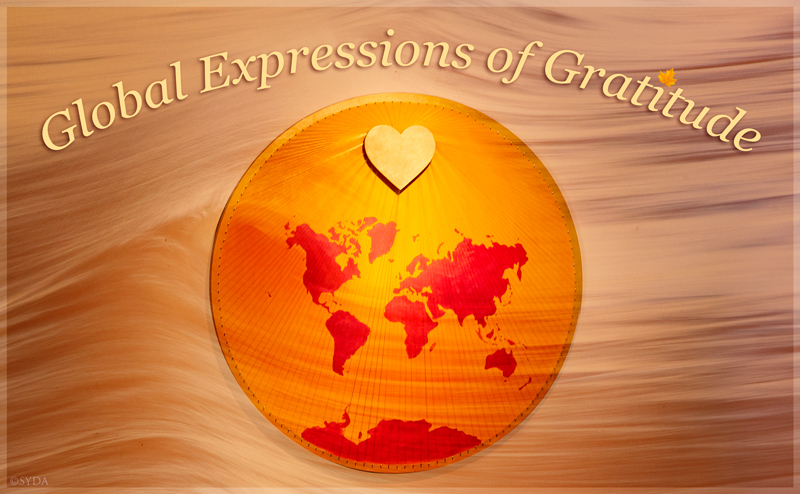 As you share your sweet words and proverbs on gratitude, and read shares from other Siddha Yoga students around the globe, let these golden words of wisdom ripple through your being with joy. Let them deepen your experience and understanding of the practice of gratitude. An old tradition that I celebrated as a child growing up in Washington State, in the United States, was the May Basket Day. On the first day of May, I would secretly place flowers on our neighbors’ doorsteps and run away before I could be discovered. It was a joyous expression of love for life and gratitude for having a “family” of neighbors around us. Adopting this tradition, I discovered that openly showing my love and gratitude through presents brings a surge of enthusiasm and love to my own heart as well. A gratidão é a expressão mais pura do amor! Gratitude is the purest expression of love! One expression of gratitude in India that my parents taught me is that whenever we borrow a pot or pan from a neighbor, we always return it filled with some goodies, mithai (sweets), or scrumptious food. For example, I might return a container I borrowed from a friend filled with yummy truffles! Grateful people are like fertile fields, they give back what they receive tenfold. Gratitude is not only the main virtue, but also the mother of all the others. Dank ist vielmehr eine Verfassung denn eine Aussprache. Gratitude is more a state of being than an expression in words. He who has not thanked people has not thanked God. In every exalted joy, there mingles a sense of gratitude. I can no other answer make but thanks, and thanks and ever thanks. One of my favorite Jewish blessings is the Shehecheyanu. Baruch atah Adonai Elohenu melekh ha'olam shehecheyanu vekiymanu vehigi’anu lazman hazeh. The words mean, "Blessed are you, our God, Sovereign of the Universe, who has given us life, sustained us, and enabled us to reach this time." The Shehecheyanu is recited whenever something new happens, such as the first day of a holiday, when a baby takes her first steps, when you see a friend you haven't seen in a long time, the first time that year that you are eating a fruit in season, when you are gathered with friends and family to celebrate a special occasion. For me, it gives words to the feeling of gratitude that arises when something special happens and I am so grateful to God for sustaining me and bringing me to this day. The literal meaning is "because of your blessings". It's a custom in Japan to say "Okagesamade" to show your gratitude when you received compassionate, kind words from someone to your recovery from sickness or any trouble. Expressing gratitude is fundamental to the Jewish way of life. The very name ‘Yehudi’ – Jew – stems from the Hebrew name Yehuda which is derived from hoda’yah, meaning to thank and express gratitude. And, the very first sentence many people of Jewish faith utter upon awakening is the Modeh Ani prayer, in which we offer thanks to the Almighty for having restored our soul. Vďačnosť a pšenica rastie len v dobrej pôde. Gratitude and wheat grow only in a good soil. Благодарение все принимает как дар; все, что мы имеем, все, чем мы пользуемся, все, чему мы радуемся, есть дар, проявление любви. Gratitude accepts everything as a gift; everything we have, everything we use, everything that makes us happy, is a gift, a manifestation of love. Gratitude towards those who have been benevolent to you is a merit, a great virtue. tánon thanónhtens ne akwé:kon skén:nen akénhake. We return thanks to the Great Spirit, in whom is embodied all goodness and who directs all things for the good of his children. Let us be grateful to people who make us happy—they are the charming gardeners who make our souls blossom. When eating a fruit, remember the tree that bore the fruit; when drinking water, remember the source that provided the water. Gratitude and love are siblings.